We got featured on The Times of India of 4th May 2015 Edition. It was really honored for our company to get featured in the leading newspaper of India for launching our application in the City of Ahmedabad. While launching this application more than 340-zone-level engineers, supervisors, sanitary staff, health and tax officers were asked to download the app. 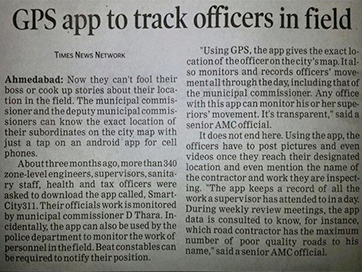 It enables the senior officers of the AMC department to monitor the work of their staff members. Further, field reporters need to post pictures even videos of the location, date of inspection, time and more.